Barcelona is one of the finest and most popular cities to visit in all of Europe, packed with out-of-this world architecture, dripping with delectable art and lined by fantastic stretches of golden beach. When you arrive at Barcelona’s El Prat airport, everything from Gaudi’s masterful Sagrada Familia to the iconic Camp Nou stadium is conveniently located, just a 30-minute drive away. We’re located at Terminals 1 and 2 of the airport with an array of vehicles on offer, so you can pick up your car and be on the road as soon as possible. Choose from our wide selection of vehicles to find the right car rental for your needs. Barcelona may be one of the biggest and most important cities in Spain, but it’s also very proud to be the capital of the region of Catalonia, celebrating its heritage with its own traditions and style. In contrast to the regal grandeur of Madrid, Barcelona is home to Gaudi’s modernist designs, which are colourful, instantly recognisable and a worldwide symbol of the city. It’s also home to some fantastic cuisine, with the sea providing an integral influence that flows throughout the Catalonian larder. No other city owes as much of its aesthetic and overall atmosphere to a single architect quite like Barcelona does to the iconic Antoni Gaudi. Many of the city’s most famous buildings were designed by the visionary architect and, to this day, his ability to dream like no one else could is one of the defining reasons Barcelona has become such a firm favourite with visitors. The unfinished Sagrada Familia is perhaps the most famous of Gaudi’s creations and is one of the main reasons people choose to visit Barcelona. Its towering design is still a work in progress, with modern architects being charged with reinterpreting Gaudi’s vision. Be sure to also take a stroll through Park Guell, a series of quaint gardens and striking ceramic monuments all designed by Gaudi and his most prominent collaborators. You can while away a few peaceful hours here enjoying surrealist wonders in a serene setting, from pavilions to elaborate dragon sculptures. Barcelona isn’t all just Gaudi though. The Barri Gotic, or Gothic Quarter, is a treasure trove of medieval buildings that will transport you to a different era of Barcelona’s history. There are also a variety of pulsating bars and restaurants in this area, so it’s great to explore of an evening. When the weather gets balmy in Barcelona, it’s time to hit the beaches, which are as plentiful as they are delightful. One of the closest and best is Barceloneta Beach. Here you can kick back on the golden sands and enjoy the gentle crash of the cerulean blue waves against the shore. You can also get more active on the waves by turning your hand to some water sports. Sample a little wind surfing, kite surfing and sailing, or if the adrenaline rush isn’t for you, just head to the nearby restaurants for a refreshing drink and tuck into some tapas. Alternatively, head to Icaria Beach, a popular destination with ample parking space and plenty of high-quality beachfront hotels. Devour sumptuous Spanish cuisine at one of the many restaurants, plus it’s conveniently close to Olympic Port, where you’ll find seafood, excellent shopping and can marvel at Frank Gehry’s shimmering Golden Fish structure. Located about 35 kilometres southwest of Barcelona, Sitges is a wonderful Mediterranean coastal town with a fabulous stretch of serene coastline. In the centre of town, you’ll find an array of top restaurants and chic shops plus art galleries and museums. Originally a workshop of renowned modernist artist Santiago Rusinol, the Museu del Cau Ferat is a mesmerizing gallery with works from himself plus other notable artists, including Picasso. Barcelona is also close to towering mountains where you can walk, breathe pure air and savour panoramic views of the Spanish countryside. Montserrat is about an hour’s drive north of the city but well worth the trip as it provides a peaceful contrast to the buzz of Barcelona. Drive to its famous monastery first, which has a car park, before heading out for a walk to enjoy the unsurpassed scenery. With car rental in Barcelona, you can peel back the layers of this magical part of the world at your own pace. Spain as a modern, well-connected road system that’s easy to navigate and a pleasure to drive on. Barcelona is no exception and while the road system gets more intricate as you near the old town, it’s still very user-friendly for visiting drivers. When you get out of Barcelona into the surrounding countryside, you’ll find smooth roads on which you can enjoy Spain’s varied, sun-kissed landscape from the comfort of your car. simply head north on the C-31 and follow the road signs. If you’re heading down the coast, you can use the C-31 or C-32 which intertwine all the way down past the lovely resort of Sitges. You can then access other routes that will take you onwards towards Valencia and Malaga in the far south. When driving around Barcelona, you can use the B-10 in the south and the B-20 in the north, which form a ring road and offer an array of different ways into the city’s districts and suburbs. When driving at night, just remember that you can’t put your lights on full beam in the city. 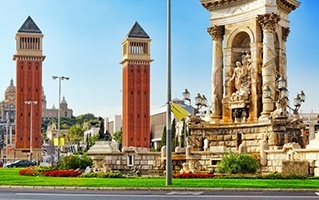 There are some toll roads surrounding Barcelona which are typically titled with an A or AP, such as the AP-7, but you can generally find a free alternative, even if it slightly extends your journey. Our local team will be happy to guide you through how to pay for tolls. In Spain’s built-up areas, the speed limit is 50 km/h, whereas on first and 1st and 2nd category roads the limits are 100 km/h and 90 km/h respectively. On main highways, you must maintain a minimum speed of 60 km/h, while the maximum speed is 120 km/h. Like elsewhere in continental Europe, you drive on the right side of the road and overtake on the left.